Age keeps you tucked into your shallow bed most days, under the neighbour’s spruce tree where you camouflage with the landscaping of boulders and river rocks and mulch. For weeks you have been ignoring the posse of younger hares as they pose and cavort and defy gravity - a thousand slinky-toys leaping and spinning down the centre of the road. They have never met fear, these young upstarts, thumbing their twitching noses at automobiles that pause for them,ignoring the house cats who give them a wide berth. But you have seen too much to be that carefree. Your caution has served you well, made you the doyenne of the lepus townsendii campanius of the Fish Creek region. I see it in your chiselled face, sharply angular even by jack-rabbit standards. I sense it in your bulging eyes as you survey me warily, standing your ground but ready to bolt at the first sign of danger - watching me as I sit on the front steps watching you, happy that you have emerged from your shallow bed to sample the fresh growth of the spring lawn. 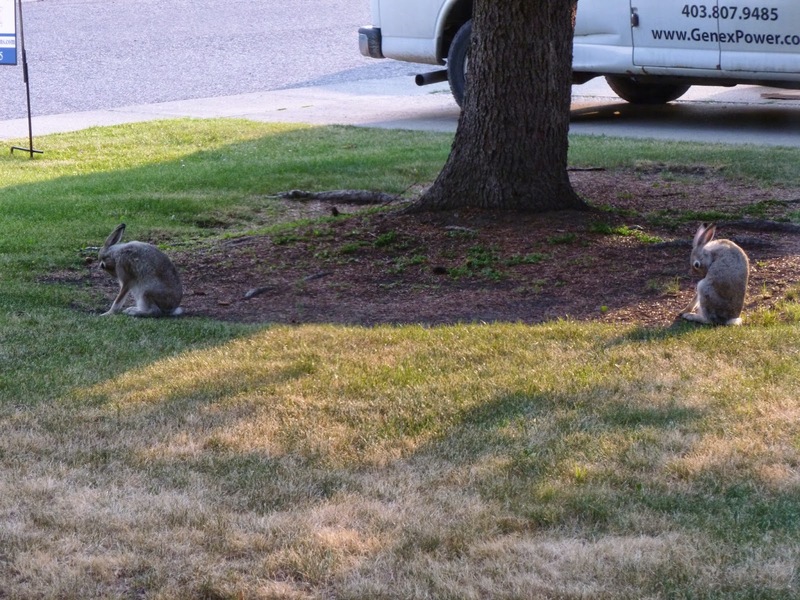 We both scoff silently at the folly of the teenaged hare fifteen feet away who feeds with his back toward me. A hare-pin turn ~~ I love it ~! Lately I've been treated to seeing such a veteran warily munching various yard items in Texas, and a Doppelgänger-bunny in another yard in North Carolina, eating dandelion stems whilst watching the trees and sky, last weekend. Hare-pin turn! Touche, Erik! You are a master wordsmith. May you continue to enjoy the dining habits of doppelbunnies around your great nation.